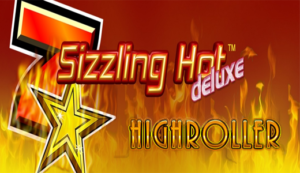 High Roller Sizzling Hot Deluxe is a high-roller version of one of Novomatic’s simplest slot games. The graphics are all very simple. The only special feature is that the symbols that land in winning positions light up in flames. Payouts make everything sizzling hot in this slot! It’s a very well-liked game and that’s on account of the RTP being so high. The theoretical payout percentage of this Novomatic slot is 95.66%. You can’t get simpler than the high-roller version of Sizzling Hot Deluxe. If you’re not a fan of anything overcomplicated or fanciful, then choose this game and you won’t be disappointed. There are five paylines and five reels, and that’s it! High Roller Sizzling Hot Deluxe doesn’t give out Free Games but it does have a Scatter symbol. Other than that, the symbols are typical of Novomatic and slot games in general. Plain cartoon fruits, red sevens and golden stars are all that can be found on these reels. The background is plain red and the logo is designed to look like a neon sign! Like other Novomatic games, it’s easy to adjust the settings. When you are playing on desktop, you’ll see all of the settings at the bottom, underneath the reels. Press ‘Start’ to spin the reels, and you can press it again to stop them half way through a spin if you want. Press ‘Auto’ to start automatic mode, so you don’t have to keep spinning. For all you high rollers out there, there’s a ‘Max Bet’ button which makes it convenient for you to increase your bet to the maximum. If you don’t want to play on maximum bet, you can use the plus and minus buttons to set the bet to your preferred value. Press ‘Menu’ to open the paytable and read all the other information and the help section. As the name might suggest, this slot game is hot! When you spin the reels, you’ll want to be on the lookout for identical symbols. There are five paylines that pay the wins, so the symbols that match have to land on one or more of these. Symbol payouts are awarded when you get the required number of matches to fall consecutively from the leftmost reel (reel 1). One of the least valuable symbols at the High Roller Sizzling Hot Deluxe slot is the cherries and this awards the smallest payouts. The cherries can award payouts for 2 matches as well as for 3, 4 and 5 matches, like the remaining symbols. The other symbols that give small payouts are: the lemon, the orange and the plum. 3 of a kind pay 4x your bet, 4 of a kind pay 10x your bet and 5 of a kind pay 40x your bet. The watermelon and the grapes pay 100x your bet for 5 matches, 40x your bet for 4 matches and 10x your bet for 3 matches. The red seven is the symbol you’ll want to watch out for! When you match up this symbol, you’ll get huge payouts! 3 red sevens pays 20x your bet. 4 red sevens pays 200x your bet. 5 red sevens is the biggest win you can get in the game and this combination will pay 1000x your bet! The golden star Scatter symbol gives payouts, too, and this symbol can pay from any 3, 4 or 5 scattered positions. 3 Scatters gives a win equal to 2x your bet. 4 Scatters pay out 20x your bet and 5 Scatters pay out 50x your bet. You can use the gamble game to risk your payouts. You might double your money but you also have the same chance of losing it! Novomatic do make some cool, complicated slots for those who like something different with a bit of a challenge. Monkey’s Millions has tons of different bonus games that can be triggered at any time, which makes it super exciting to play. Kingdom of Legend is also a very unique and thrilling game, set in a fantasy land with Orks! If you play High Roller Sizzling Hot Deluxe and you enjoy it and you’d like to play something similar, Novomatic have got your covered. Many of their early games were simple slots and they continue to release games like this! The most-loved fruity games of theirs are: Lucky Jolly, Simply Wild, Power Joker, Golden Reel, Awesome Stars and Amazing Sevens. Try them for free and then head over to your favourite Novomatic Casino to play for real money!